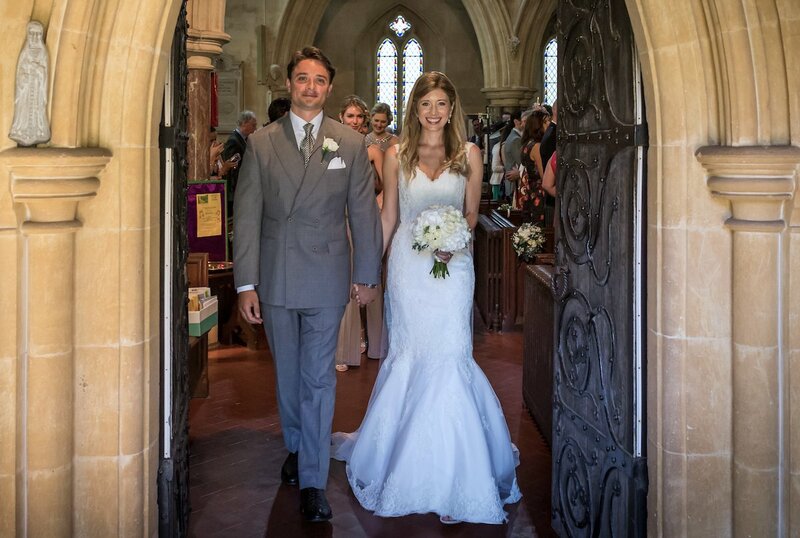 It is the time of year for wedding preparations, so I thought I'd take the opportunity to share images of my friend Oliver's wedding last year. He is wearing probably my favourite groomsman's outfit. First, the colour. Pale grey is suitably serious - being plain and monotone - that it befits the formality of almost any wedding. But, the grey is pale enough that there is no chance it could be mistaken for a business suit. Mid-grey and darker, yes. Pale grey, no. Second, the style. A double-breasted jacket is slightly unusual, but only slightly. That means it's unlikely anyone else will be wearing the same thing; you will feel satisfyingly stylish, and sartorial; and you'll stand out without resorting to bright colours or a silly waistcoat. 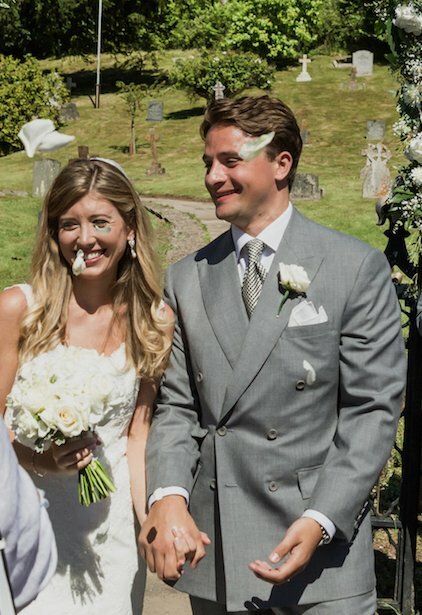 A double-breasted pale-grey suit also stands a slight chance of being worn again - which is understandably a desire for most grooms, given it may be their most expensive piece of tailoring. You're unlikely to wear it to the office, but it would be good for any other formal day event. If you want something more office-suitable, make it a mid-grey, and/or single breasted. Third, the shirt. Only white will do really, being more formal than blue or any pattern. But take the opportunity to wear one with double cuffs, so you can have cufflinks. There may even be an old family pair that would bring a sense of tradition. Fourth, the tie. A small black-and-white check is a traditional pattern for a wedding tie, for formal for similar reasons to the rest of this outfit: it is monotone and discreet. Styles similar to this are often called a Macclesfield (the British home of silk). The shoes have to be black oxford - the most formal colour, and the most formal style. You could get away with a very dark brown, if black shoes are just too office-y, but black suits the refined elegance best. The only thing I'd personally change from Oliver's outfit is a smaller boutonniere, inserted through the buttonhole. But that can be specific to the event: remember, this is no way your day; it is your bride's. You are merely elegant support, which is another reason a subtle and refined outfit works so well. The suit, by the way, was made bespoke by Whitcomb & Shaftesbury. Smith Woollens, Gilt Edge range (SW 6114), 8/9 oz pure merino. Double-breasted jackets are so hard to fit well off the rack, and so are another reason to have one made for a wedding. This also fits beautifully - snug at the neck and through the top of the back, smooth drape through the chest, and a lovely pitch on the sleeve. The tie was from Tom Ford, shirt from Eton, and shoes from Foster and Son (ready to wear). I'd recommend it to grooms everywhere. You can follow the discussion on The perfect wedding suit by entering your email address in the box below. You will then receive an email every time a new comment is added. These will also contain a link to a page where you can stop the alerts, and remove all of your related data from the site. I like everything about the outfit. Fit is very good, too. If only this post had arrived in January — I’m into my third fitting for my wedding suit, however will take on board the shirt/tie and shoe suggestions. White was always gone to be my choice of shirt colour, but was considering a silk knit tie and a pair of Edward Green Audley monks; would both be considered too informal for the occasion? It depends on the event and suit obviously, but I would go for a printed or woven silk tie rather than a knit. And monks could be nice, particularly that style and if in black. Lovely suit but a shame he is wearing his flower incorrectly. A very nice looking suit, although I would have perhaps gone a tad longer in the coat. Do you know if it is W&S Savile Row or Classic? Thanks for replying, Simon. Woven silk or a silk grenadine may be a good option. The suit is a three-piece in a navy fresco, so I expect a knit silk would be too close in terms of texture to the fabric of the suit. I like this suit but surely more appropriate for one of the guests? A traditional morning suit or military dress uniform are the only two garments that are correct to match with a bride wearing a white wedding gown, nothing else will do. I disagree, I have to say. Particularly saying such things are ‘correct’. There are no absolutes of right and wrong here – if there ever was, it was driven by the social expectations of those at the event, and it would be rare to find a wedding these days where this was what they expected. Rules, as in most areas of clothing, are to be understood and applied with eyes open, rather than followed blindly. Military dress… perfect as an easy option for the less imaginative and those that don’t want anybody to forget they’re in the military. I’m a year away from my wedding, so this is helpful to provoke thinking about my outfit. I take your point Gustav, but I do also think that it’s a nice thing to focus on her. It’s certainly a personal point. And either way, I would say you should be simple and elegant, not flamboyant. Not a fan of the morning suit? Not particularly – I’d prefer a beautifully cut suit, and of course a morning suit is even less likely to be worn again. The big problem, I find, with a morning suit, is that people generally don’t own one. Even if they do, the chances of their father, father in law, brother, best man, ushers etc. all owning them is relatively slim. So, in order to get to the point of being able to assemble a full bridal party, you are looking at hiring suits for at least some people, and these are invariable awful – made of nylon, cut too big etc. Even if you, as the groom, wish to invest in a morning suit, it doesn’t solve this problem. The answer is to only specify the dress code as morning coat if you are sure that most of your guests will own one or at least understand what it should consist of (i.e. 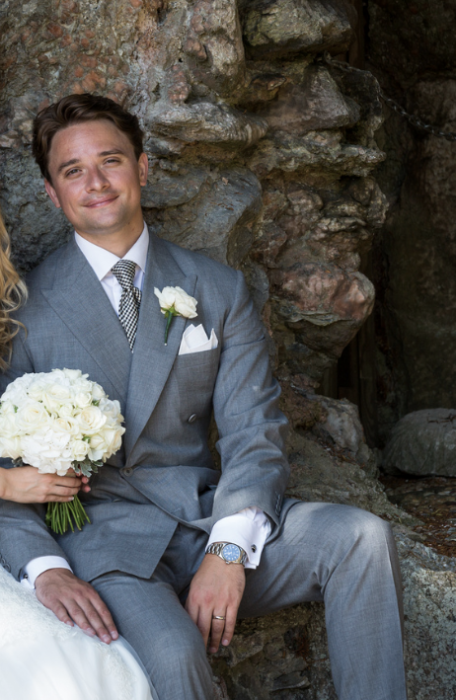 no frilly cravats with matching waistcoats and pocket squares as many rental shops would have us all believe…) and be able to turn up looking fairly smart in it. IMO it just looks a bit forced if only the bridal party are in them. as to the question of investing in a morning coat – it’s not much of an INVESTMENT if you are never going to wear it again… but if, as i have said above, you know that most of your guests will be able to rock up in one, then the chances are that you move in circles where you in turn will be invited to weddings stipulating morning dress and it becomes an entirely different kettle of fish. I agree, you either moves in circles where morning coats at weddings are the norm, or you do not. In the former case, it is indeed not much of an investment. I own two morning coats in different weights and a light grey morning suit, to continue the theme in this article, and they all get worn often enough to justify their existence. I bought the first one for £50 secondhand and had it adjusted: it is a 1930s bespoke morning coat made by Connock and Lockie. Hardly a big investment either, and rather better than a hired outfit. There is one problem with morning dress at weddings, however, and that is the inconsistency of wearing top hats. If the groom does not wear a top hat, it seems bad form to upstage him. With lounge suits at weddings, the problem does not arise. I like this groom’s db suit, but I agree with Simon about the boutonniere, and the flower would look better held behind the lapel in a loop. Couple of things – this post really shows how photos can be deceptive regarding colour on a screen. On the cover of your post the suit looks almost airforce blue on my screen yet the same photo in the body of the post shows quite clearly that the suit is light grey. I also thought that the grooms watch ( looks like a Rolex datejust ? ) was suitable for the occasion i.e. as a opposed to a large divers watch with coloured strap which I saw recently. Great post – its always good to see people wearing bespoke clothes in real situations. Hi Simon. What is your view about morning wear for a wedding? I really like the cloth used in this suit. Can I ask, what would be the minimum weight you would suggest for morning wear? Obviously you have to find a balance between the coat hanging properly and remaining structured in the tail, against the fact that it is three piece and usually worn in the summer. I would be very interested in your opinion. A morning coat can be lovely, but I would suggest having it made – and that can be costly, for something that would rarely be worn again. I would suggest going for around 11oz if you can. If not, then 8/9 ounce as here. What about a black tuxedo? Anywhere outside the US, never… it’s an evening outfit and shouldn’t be worn to a day event. But for those in the US where it’s accepted, sure that would be nice. Tuxedo styling and etiquette of course a discussion for a separate post. The rule I always heard (here in the US) is that one dresses for the end of the event, not the beginning. So if an event begins in the afternoon but finishes in the evening, then a tuxedo would be appropriate. The “Tuxedo” is standard wear at a wedding in the US, and will often be seen in the morning if the event is timed then. Of course tuxedo it is also an Americanism; dinner jacket is its proper name. Well, that’s the British English name for it. But since we’re talking about what we all seem to be regarding as an American tradition, its surely not wrong (if it ever could be wrong) to call it by the American name. I’m not sure that “proper” comes in to it – its not like it is an exclusively English form of dress. Wrong. Born in England, exported to the USA, where it changed its name to that of the place where it became a popular form of dress. But then again its called a Smoking by the French……. Yes, it’s a good point. When I heard that principle, I was imagining a wedding that began in late afternoon and finished in the evening – so evening wear was appropriate. Wearing a tux for a morning ceremony would be a bit odd, even if the event lasted through the evening. Love the site and all that, but I want to call you out on this. A bit further up the page you say “there are no absolutes of right and wrong here”, but saying “never” to a tuxedo at a wedding is exactly that. Morning suit, military dress, a black tuxedo or a suit, it is your wedding so wear what you want to wear. Good point Ben, I shouldn’t have said ‘never’. Each to there own I’d say. If you are lucky enough to be invited to someone’s wedding then you should have the courtesy and good grace to partake in their vision of their Big Day. I’ve been to a wedding where black tie was requested for a English summer daytime event set in a field, and followed by jazz & cocktails in a marquee with nods to a speakeasy. A unusual perhaps, and of course not everyone’s cup of tea, but it represented the couples interests perfectly, and as such felt wholly appropriate as well as being memorable and good fun. I married in Canada, where a Tuxedo for the groom and other men in the wedding party is also common. For many men it will be the only time they ever get to wear one. If I were to do it again (Heaven forbid) a suit like this one would be a much better choice. Honestly Simon, how could you say such a thing in this day and age? Surely outdated rhetoric. My Fiance is the love of my life and we’ve been together for 14 years; we are preparing for OUR wedding next year. Our relationship has always been equal why would our wedding day be any different? Thanks Martin. I don’t think it’s worth getting into a discussion of social mores here, and it’s also obviously a very personal point. I must say, I was mildly amused by you cropping the bride out of most of the photos, after saying that it’s her big day! I agree with Simon … after all marriage is an invention for the benefit of women, it traps men into being monogamous with one women who will take half your assets if you leave her or she finds someone better. Therefore it’s only right you should recognise that it’s her day to celebrate. Ps Simon I hope you don’t delete my comment, I want to save as many style forumites as I possibly can. My God! To you & G. (see above): the reason is you’ve to be a gentleman! Period. What about wearing morning dress? How does one wear morning dress uniquely and interestingly? An interesting area, but definitely one to discuss separately if that’s ok. Yes please, but would love some input soon! Will be getting married in a year, so will need to think about commissioning in 6 months!! I stand by my earlier comment! I am looking to get my first ever savile row (most likely Anderson and Shepard) for morning dress. Any tips if that is a good choice for the style, or how to buy / wear it! Would be highly appreciated!! With the pale grey colouring, would this be acceptable for a business environment? 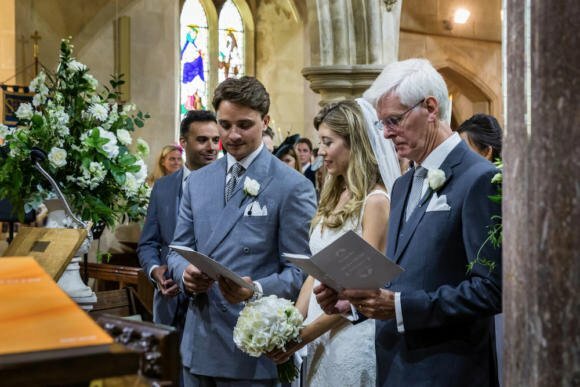 I ask as I recently had a single breasted fresco suit made in a similar mid/pale grey colour and have thought before that it’s a bit “wedding-y”. If wearing to work on a warm day, would toning down the formality in, say, a coloured (or striped / patterned) shirt and textured tie help lose the assumption that I’m off to a wedding with my briefcase?! The FOTB is not too shabbily dressed either. I find the perceived formality of the DB suit to be somewhat confusing. In theory they are supposed to be less formal than a standard SB jacket, but they are so rarely seen these days (particularly on younger men) that they instantly convey the sense that one is ‘dressing up’ for the occasion. Today they are pretty much always more formal than an SB. The only useful exception is black tie. The formality of a suit has generally been about how much of the shirt is covered up, so in theory a DB is more formal than a single breast, but less so than a three piece suit. Thank you soooo much for this very instructive and lovely post!!! I’ve seen almost all your posts, and that means including posts that I had thought to be great. But this one is the greatest so far, really! I would like to thank Oliver, presumably a regular PS reader, for having allowed these nice pics be posted to illustrate the subject of this post! This is really kind! A great service to many folks well beyond PS readers, mind you! Now a question to you, Simon: how could, say, a friend attending such a wedding choose his own outfit to suitably match the sharpness of Oliver’s? As a guest of a wedding, it’s essential to understand from the organisers (bride’s family, bride and groom, or other) what is appropriate. You are absolutely not there to stand out, and therefore you don’t want to be too smart (eg morning coat when no one else is wearing one…) or too informal (no tie when everyone else is wearing a tie, perhaps). Once that is understood, you just need to play accordingly. So in this case a similarly simple and elegant suit, with tie and probably handkerchief, would have been best. But you could play a little around the edges – eg dark-brown shoes, or a checked suit in a sombre colour, etc. I was at a country wedding last year where the dress code was suits. I had taken a blue linen and a black/white houndstooth suit and as the weather was wet I chose the houndstooth. I was surprised that nearly all the other guests wore dark suits almost city suits. There was one morning coat. Is it just me, or is this suit a lot more drapey than the ones they did for you? No, it’s pretty much the same. Oliver does have a much bigger chest than me though! Really nice outfit and a very nice balance between something special enough to feel like a wedding outfit while being versatile enough to wear again. To all the commenters who insist a morning coat is the only option, can you really justify the cost of getting one made bespoke?Unless you’re a regular on the Ascot circuit and/or have an unusually high number of friends who insist on very formal weddings (or are just very wealthy, which I guess you probably are if you fall into the first two groups!) I imagine the answer is probably no. Given that, wouldn’t you rather have a bespoke suit than a RTW morning coat? Would a navy suit look to business-y? The three pockets with flaps, especially the change pocket have to me taken this down a level. On a double two only, and flawless would have been perfect. Jacket a little too short too. Does the right lapel have a button hole too? It’s called a ticket pocket, and is standard issue on a DB if you choose to have one. Suspect no as buttonhole is worn wrong. There is a button hole but as the rose was large it didn’t look right. I too would have selected a smaller rose and worn it through the button hole but the florist didn’t understand the definition of a small rose! Thank you for all your nice comments, it was a pleasure to wear on a very special day. This is a very nice wedding suit! I appreciate that he is wearing black shoes, too. Black shoes have become unfashionable in the US, and people here would somehow consider them wrong with a pale grey suit (or really anything). The last wedding I attended had the groom and all of the groomsmen in mid-grey suits with satin trim (urgh) with mid-brown shoes. It was better than the get-ups I saw two wedding parties wearing for photography this weekend. One was dressed in a waiter’s uniform of black waistcoats and trousers (no jacket) and the other was in grey trousers and clip-on braces with nothing over the shirt. Americans somehow think they need to wear these kinds of things for their weddings without considering the formality of the occasion or how ridiculous they may look. I definitely agree that this is a very good choice for a wedding outfit. I personally don’t like morning dress as it is too much like a period costume for me and as you would wear a morning dress very seldom it would be pretty bad investment for a bespoke order and if it is not bespoke, chances are, that it will fit bad and at the end of the day you would be poorly dressed on your wedding day. Black tie is also a bad choice as it does not look so nice under the bright sun light. I would switch to black tie in the evening. So this pale grey db suit is really a very good choice – looks good and it is practical. 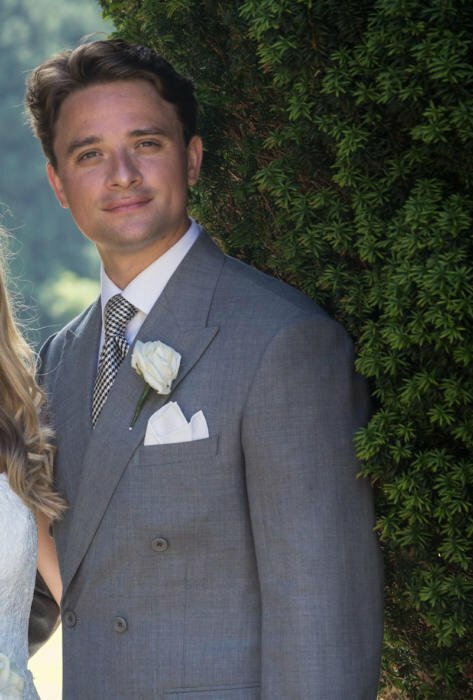 I personally don’t feel that grey suits me so in my particular case I would wear a blue double breasted suit for my wedding one day in the future. I am a fan of morning dress. Yes having it made bespoke may seem like an extravagance but there are other events such as Ascot where it can be worn. Tailors such as Graham Browne could make one at a reasonable price. I would also suggest that as it is not frequently worn, it would last a lifetime. Simon, I echo the above comment that it would be really interesting for you to do a piece on morning dress. It is something that can look incredibly elegant if done well, or awful if done badly. Particularly pertinent at the moment as we enter the racing/wedding season. I think the problem with this is that Ascot is basically the only other event it can be worn at (rather than an example) and unless you get invited to weddings regularly where everyone is invited to wear morning dress (in my circles, very rare indeed) that leaves you only with weddings where you form part of the bridal party. Often as not, there will be a (perhaps loose) colour theme on such occasions which your bespoke coat might not fit and so must be left at home. Of course, there is the Pippa Middleton model where everyone is sufficiently wealthy that you can request morning dress is worn by all and have that rather nice collage of complimentary but slightly different coats and tasteful waistcoats which you see on such occasions where everyone owns a bespoke (or inherited) morning suit… but in the real world I fear you are just inviting most of your guests to hire a morning suit from Moss Bros, at considerable expense for an ill fitting 80% nylon monstrosity! Weddings where morning dress is worn are not so uncommon in the UK and if you are a normal shape a RTW coat may easily fit you. I have both a RTW and bespoke morning coat and have had plenty of use from them over the years even without going to Ascot for some time. Not sure where you’re from but in London I wear morning dress on weekdays till 6 whereupon I change into a lounge suit or if going to a formal event dinner jacket. Personally I like old world style and couldn’t give a hoot what the general public makes of it, the jeans and hoody clad publics opinion means very little to me. There is nothing more elegant and refined that a morning coat hristo! When you say “silly waistcoat,” does this mean that you feel any waistcoat is silly, or just those tacky odd waistcoats? 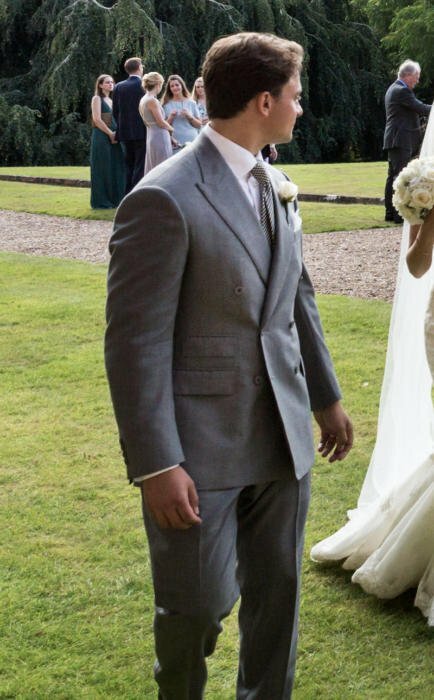 Hace you ever worn your double breasted prince of WAles suit in a wedding? I’ve also been fascinated by morning dress at weddings, simply because it’s something that does not exist in the US. It wasn’t always so – in the early 20th century morning dress was found in the US – but nowadays I’d guess that even white tie would be more common. It was still the norm for US presidents to be inaugurated in morning dress until the beginning of the 1980s, the first inauguration of Ronald Reagan in 1981 I think being the last occasion. Yes, you’re right about that! Though Ford and Carter wore regular suits, it was somewhat common for presidents to wear morning dress at inauguration. I believe Reagan technically wore a stroller suit though, not a morning coat. I got married in a very similar suit in 1976 and the photos still look good to this day. In forty years time the bride and groom will look back with pride knowing they got it absolutely right. The only small detail I would have changed would be to drop the ticket pocket. For me, it never looks quite right on a DB – I’d appreciate Simon’s view on this. That said, it is literally a small thing – they all look great. Hi Simon, I’m due to tie the knot next summer and have started thinking about what to wear… at the risk of appearing too nonchalant I really wanted to shoot for something Neopolitan (I’ve never had anything commissioned in that style before but find I’m moving towards much softer lines generally e.g. I seem to live in a boglioli jacket these days). Is there anyone you can recommend who visits (or is based in) London in the £1.5-2k bracket for a two-piece? Solito seems to start around £2.5k – if it really is the best around that price point then I can probably stretch to it but just interested to know if you’d recommend anyone else who would cut a similar style at a slightly lower cost. Also any English tailors I should look at who would do a softer style? I’ve seen e.g. Graham Browne claim to be able to make a Neopolitan style jacket – am I right to be a bit dubious? Really grateful for any thoughts. I wouldn’t say Solito are the best – more the cheapest for that style of make. And I’m afraid there isn’t really anybody bespoke at that price point. I’d certainly recommend Whitcomb & Shaftesbury for something softer than most British tailoring, but it won’t be Neapolitan by any means. And yes, I wouldn’t have that style from GB. Anglo-Italian (opening today!) might be a good shout for a handmade Neapolitan made to measure. Whats this Anglo-Italian place all about? Anything more concrete we can google for ? It’s the new venture by Jake Grantham and Alex Pirounis, both ex-Armoury. Opening on a side street of Marlebone High Street tomorrow, offering RTW and MTM Neapolitan tailoring alongside several other things. That sounds interesting. Can you remember which street………there are a few. 57 Weymouth Street. I hesitate to say that all are welcome, as I don’t know that to be the case. from your comment does it mean you need to book? Any idea how Anglo Italian MTM would compare against P Johnson? +1 for morning dress at weddings, if that is your preference. I see no issue with the core wedding party wearing proper morning dress (not hire), whilst extended guests wear suits. Well made morning coats last decades and can be matched with changing trousers and waistcoats over the years. Finally on morning dress, I disagree that the only other use is Ascot… don’t forget Epsom! At the same time I very much like the groom’s suit in this case. Have just picked up my first finished suit from W&S, also double breasted but in navy, and had first fitting of a tropical-weight single breasted in dark grey that already looks superb, and is destined for use as best man at another wedding, this one in Tuscany in August! I agree. I would go further and say there’s nothing wrong with even the core wedding party wearing a variety of different things. There’s no need for everyone to wear a matching uniform, even if you see that at many weddings (especially in the US). A mixture of morning dress and well cut lounge suits looks perfectly fine – and, to my mind, is preferable to forcing some people to rent. Hi Simon, Greetings from the antipodes. I’m considering a navy suit for a wedding in a few months time and I noticed the comments about the potential for it to look a little too ‘business-y’. Are there some ways to avoid that a little? Would you stick with a white shirt, grey tie, plain pocket square, black shoes? Or is there some scope to alter any of those a little? This will be a relaxed garden wedding with a fairly relaxed dress standard given what passes for sartorial elegance in New Zealand. Hi Simon, Yes I’d considered a mid grey suit but wonder if I’d get much further wear out of it. I was wondering if there’s some way of alleviating the serious business look of the navy version? Perhaps I should add that this would be my first suit. You could certainly add dark-brown shoes rather than black, and a pale tie would much less business-like. But a mid-grey suit would still be useful going forward. Hi Simon, Thanks for the replies. At the age of 50 I’m not sure how much going forward there is. As I said we have very relaxed dress codes here and I work in the creative & education fields so there’s not a tremendous call for wearing a suit. I guess I’m battling between the mid grey and navy in terms of the day itself and wearing the suit occasionally after that. I suppose that tie, shoes, pocket square are really the only place to dress the suit up or down a little. Kind regards, John. This looks great. I am getting married next December but have been researching the perfect suit for some time. I would quite like to use a bolder material and wondered if this is something they would offer. This will be my first bespoke offering and wondered if it would be okay to ask them to produce a double breasted waistcoat or if this wouldn’t be in keeping with their “house style”? I would love to hear your thoughts as this is all quite new to me and want it to be perfect for the wedding. As a long time (somewhat addicted reader!) may I say your blog is tremendous? A non- simple question – what are the relative merits of a Dege & Skinner MTM at around £950 inc vat versus the W&S classic bespoke? I ask because I have just checked the W&S website and see that the price of W&S seems significantly more the articles/comments here suggest – around £1700 inc vat for the basic model. That makes W&S very expensive, doesn’t it? Thank you Simon for this inspiring website ! I was wondering what type of collar I should wear with a double-breasted suit (and tie).. I noticed that you like spread collar shirts but I am personally fond of snap-tab collars, which I think is so elegant and very unusual here in France. Would it look good with a double-breasted ? Does it depend also on my physical appearance ? Brilliant website and info that you provide! I’ve learnt so much in the last week or so browsing through this. I’m looking for my own wedding suit and have decided on bespoke as opposed to M2M (mostly thanks to this site) however budget wise I’m not in a position to go crazy. I was v interested in your comments on the Whitcomb & Shaftesbury classic bespoke as a great way to keep costs down yet still providing a quality product. Are there any other Tailors who you would also recommend or in this ball park do you still feel that they’re the best value? Really pleased to hear it! Simon, I’m attending a country wedding in Gloucestershire between Christmas & New Year. Given the location & more relaxed time of year, I’m considering wearing a navy corduroy suit with a wool or knitted tie or a tweed jacket with either cords or grey flannels. I considered a tweed suit but would prefer more versatile dress given that l live on the Equator & would like to be able to wear the pieces separately (in more temperate climates). Equally, it is entirely impractical to have something made due to the local unavailability of appropriate fabrics. I’m also uncertain of local tailors’ ability to work with the material. I would welcome your opinion on the choice of outfit & also on decent off-the peg retailers (Cordings or Walker Slater, for example). Thanks very much for your help. That sleeve pitch is indeed lovely! On the topic of wedding outfits, what is your opinion on Tommy Shelby’s wedding outfit in Peaky Blinders? I love the bespoke suits they made for him, but a mid-blue flannel with a navy grenadine tie strikes me as an odd choice for a wedding suit — especially since the show is otherwise very historically accurate, at least to my knowledge (of course the non-bespoke suits really detract from it, some lapels are hideous).